As of December 2017, CARE estimates there are approximately 204 private service and public drop-off sites for carpet in California. Preliminary analysis of sites operating at the close of 2017 shows that 95% of the state’s population lives within a county with access to one or more private or public carpet recycling sites, providing an average of one site per 186,000 people. Twelve counties have five or more sites, six counties have ten or more sites, and two have more than twenty-five sites. To better understand the issues around collection and to set further goals, a convenience study is currently underway and is scheduled to be completed by the end of 2018. Cascadia Consulting reported on the study process and interim findings at the California Resource Recovery Association conference on July 29. See presentation below. 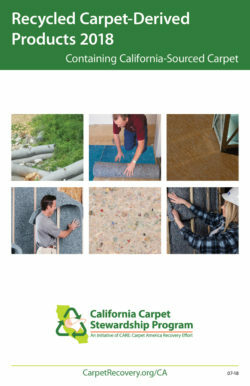 CARE has produced a catalog highlighting the range of products that contain California-sourced post-consumer recycled carpet. Featured products include insulation, wheelchair ramps, heavy-duty mats, decking, carpet cushion and, yes, carpet. The products would help state agencies to comply with the SABRC mandate and may help businesses trying to obtain environmental certifications such as LEED. Several products are designated Double GreenTM, meaning they contain recycled California post-consumer carpet material plus at least one other post-consumer recycled material. To learn more about products using recycled carpet material and the Double GreenTM designation, contact Market Development Consultant Mike Tinney to request a product presentation, made in collaboration with CalRecycle’s tire derived products group. To order print copies of the catalog, email CA@CarpetRecovery.org. Project Description/Goal: A weather cover (carport) was needed to keep post-consumer carpet (PCC) clean and dry during the rainy season. More PCC is then diverted away from landfill and recycled. Grant Amount Given and Match, if any: $10,000 granted; no grantee match in original application. Total Cost of Project: 20 hours of staff labor. Total project cost, including materials and install, was approximately $12,000. Project Challenges and Barrier Removal: Napa initially had an issue with the public drop-off site: customers sometimes placed the material outside of the roof, causing it to get wet. In response, Napa is obtaining signage to direct customers to place the post-consumer carpet under the roof. Project Benefits and Outcomes: The project has kept the PCC dry during rainy days. The drop-off site projects 60,000 additional pounds of PCC diverted to recycling annually. This is one of a series of case studies that illustrate the impact of grant funding on the carpet recycling industry in California. Visit our Post Consumer Carpet Products page. Visit the CARE Grants page. Project Description/Goal: Post-consumer carpet (PCC) needs to be kept clean and dry year-round, including during the rainy season. Zanker Recycling added a cement pad and weather cover to divert more PCC away from landfill for recycling. Total Cost of Project: 20 hours to write and manage grant and initiate project. The total project cost, including materials and installation, was approximately $20,000. Weather cover at Florin Perkins helps keep carpet dry and ready for recycling. Project Challenges: There was one unforeseen issue during shipment of the structure. The vendor had to ship missing wall panels twice during the construction phase, delaying the completion of the structure by two months. 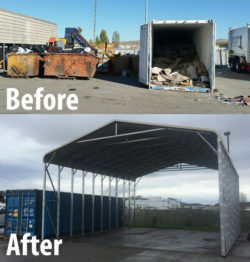 The installation of the structure and its setback from the existing operations area has increased tipping, processing and staging space suitable for keeping carpet clean and dry. Not only does the structure provide a dry staging and storage area, it also provides a shaded work space for the employees during the hot summer months. It is projected that the new weather cover and pad will increase recycling at the facility by 525,000 pounds annually. There was minimal PCC landfilled due to rain in 2017/18 compared to the previous season. Visit our Post Consumer Carpet Products page. PCC products: Visit the CARE Grants page. CARE will offer a Cycle 2 round of grants to support capital improvements and product testing in late 2017. Sign up for updates here. This winter, fewer post-consumer carpet (PCC) drop-off sites will be forced to landfill their incoming carpet due to rain, snow and mud. A CARE Micro Grant enabled Napa Recycling to construct this weather cover to keep collected carpet clean and dry. Zanker Road Resource Management and Napa Recycling and Waste Services have both completed PCC collection improvement projects under Cycle 1 of CARE’s Micro Grants for Collection/Reuse program. 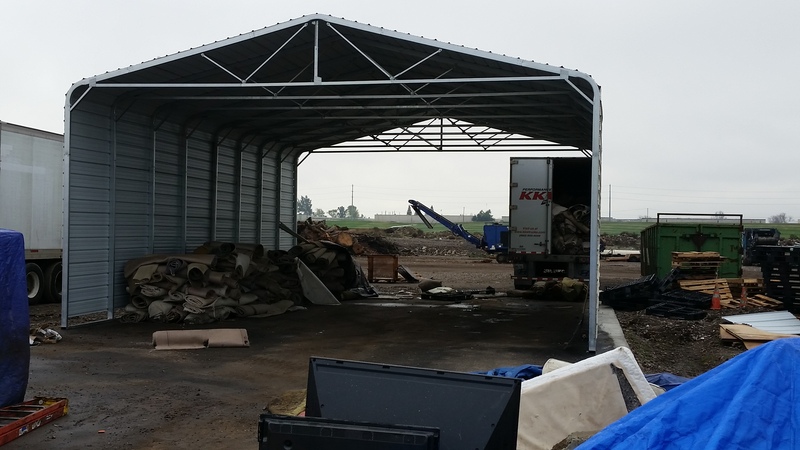 Zanker has built a carport weather cover and cement pad at a cost of approximately $20,000 at its Florin Perkins Disposal Site in Sacramento, in order to keep PCC clean and dry. This project is expected to increase PCC recycling by more than 300,000 pounds annually. CARE drop-off site Napa Recycling built a carport at a cost of approximately $10,000, and this weather cover is expected to increase PCC recycling by more than 60,000 pounds annually. Both Zanker and Napa completed the projects under a six-month timeline and received $10,000 each in grant funding. Three other Cycle 1 Micro projects are expected to be complete in the spring of 2018. Circular Polymers (formerly CLEAR), Green Waste Recovery, and A1 Planet Recycling were each awarded $10,000 for equipment to increase local collection or hauling for recycling. The California Carpet Stewardship Program has officially opened Cycle 2 of its Micro Grants for Collection/Reuse program (Cycle 2M) to California-based projects seeking to establish new programs or improve existing programs. Applications are due on April 6, and applicants may seek up to $15,000 in project funding. For more details on eligible applicants, eligible projects and application instructions, please see the Cycle 2M announcement and full draft solicitation.